My New Year’s wish for you is the joy of writing. Here’s a tip to bring verve to your story’s opening. It’s an excerpt from my book, Page-Turner: Your Path to Writing a Novel that Publishers Want and Readers Buy. But it’s equally true of a reader’s first impression of a fictional character. Their response to your story’s protagonist is especially important. Yet new writers often waste this opportunity by introducing their protagonist in idleness or passivity. Be smart – put the visceral impact of the 1st impression to work for you. Action is the key. Description of a character tells the reader mere facts and has little visceral effect, whereas showing the character’s defining quality through action produces an emotional response in the reader, leaving a deep and lasting effect. Screenwriters do this very consciously. Watch any film you admire and notice how the scene in which the hero or heroine first comes on screen demonstrates their defining quality. In other words, it shows the character’s essence. When actors first read a script this “essence in action” is the very thing they look for. I know – I made my living as an actor for twenty years. As a writer of fiction, you can use this screenwriting technique to powerful effect. 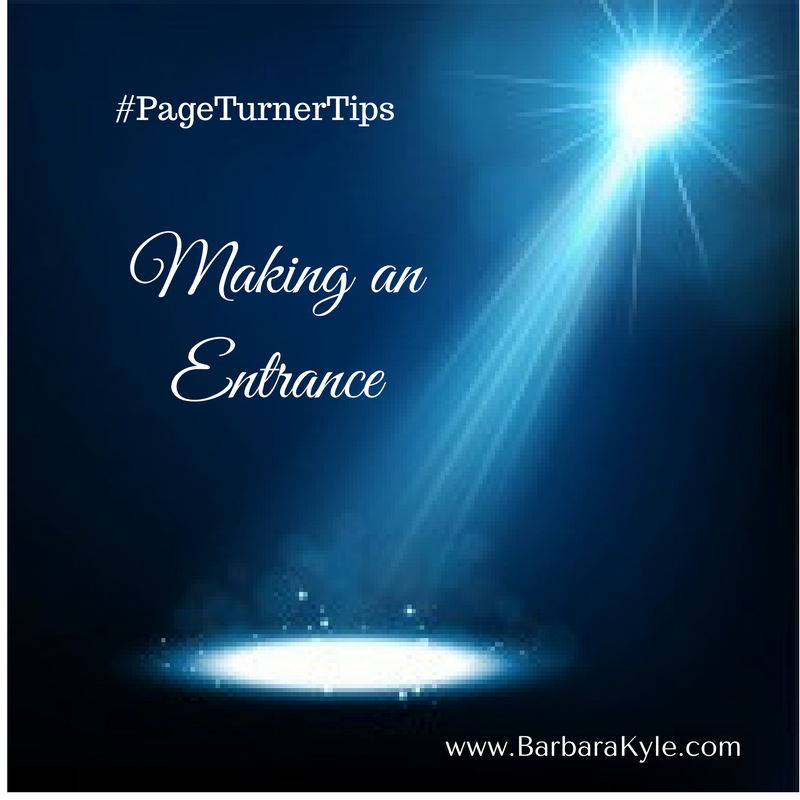 Strive to write an entrance scene for your protagonist which, if your story were made into a film, would attract an A-list actor to the role – a star. In A.S. Byatt’s POSSESSION, the young scholar Roland Mitchell, researching a Victorian poet, opens an old book in the London Library and out fall two unsigned love letters written by the poet. Roland impulsively steals the letters – and thus begins his audacious quest for the truth about his subject. Roland’s essence is his ambition to excel as the foremost expert in his field. Ian McEwan’s ATONEMENT opens with Briony Tallis, a precocious child, obsessing about the play she has written, and orchestrating her young cousins to take roles in her fictional world. Her need to control people, and her obsession with storytelling, are the essence of her character. My novel THE QUEEN’S LADY, set in London, England in the reign of Henry VIII, opens with seven-year-old Honor Larke risking her life to try to find her servant-friend amid a May Day riot. When she sees the mob viciously attack a foreigner, then move on, Honor’s curiosity and pity drive her to help the dying stranger. This is her essence, shown in action. The examples above are all opening scenes with a protagonist, but your opening doesn’t have to feature the protagonist. You may want to kick-start the story with some other event – for example, one featuring the antagonist. What’s important is that when you do bring your protagonist on stage, give them an entrance in which the action they take resonates on a meaningful, emotional level with your reader. Whether your hero or heroine is a rogue, a lost soul, a killer, or a saint, their entrance is your opportunity make them a star. Happy new year. And happy writing!